Classy, fresh, athletic and capable. It’s the all-new 2019 Ford Explorer, and it’s better than ever. In this seven-passenger SUV, you’ll find a vehicle that meets all your needs. Whether you’re looking for a family hauler or a city commuter to get you around San Francisco, a cargo-carrying SUV for all your little sportsters, or a rugged vehicle to tackle the toughest backcountry terrain, it’s the Ford Explorer you need. It’s extremely capable, but what about its towing capacity? Learn more about the new 2019 Ford Explorer’s abilities, courtesy of your local Ford dealership in Southern California. Spacious seating for seven people is a highlight for the Ford Explorer. Modern upholstery is in every model, whether it’s premium Nirvana leather in the Platinum trim, Ebony Black leather-trimmed seats with Miko inserts in the Desert Copper Appearance Package, or supportive sport fabric upholstery in the XLT trim. An eight-way power-adjustable driver’s seat is standard equipment, and three-rows of seats are easily configured for people or cargo. And with the available PowerFold third-row seat, obtaining a fold-flat floor in the rear happens at the press of a button. Under the hood, the 2019 Ford Explorer makes surprising power in a small package. Choose between a 3.5-liter Ti-VCT V6 with 290 horsepower for base performance that blows you away. More torque and better fuel economy come in a smaller package, the 2.3-liter EcoBoost I-4 with 280hp and 310lb.-ft. of torque. Or, reach for the top performer with a 3.5-liter EcoBoost V6, spinning out 365 horsepower and 350 lb.-ft. of torque. No matter which engine you choose, you’ll be completely satisfied with the smooth acceleration and abilities it gives. Behind the powerful engine lineup are the hidden heroes. A 6-speed SelectShift transmission converts all the engine’s torque to usable power for the drive wheels. The Ford Explorer can be purchased as a front-wheel-drive vehicle supported by AdvanceTrac with Roll Stability Control, Curve Control, and Hill Descent Control. Or, for more stability and traction, choose your Explorer with Intelligent 4WD with Terrain Management System. Shift on the fly to adapt to changing terrain, whether it’s mud, gravel, sand, grass, or snow. But How Much Can the 2019 Ford Explorer Tow? If you’re towing off-road ATVs or a travel trailer, or if your job requires you to tow equipment, the 2019 Ford Explorer can handle it. Thanks to its powerful engine options and strong SelectShift transmission, the Explorer is one of the best in its class for payload and trailering capacities. 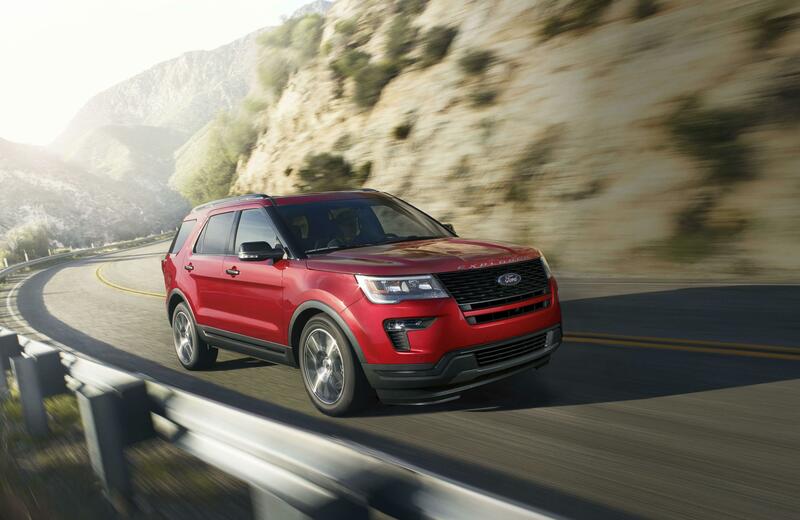 When properly equipped, the new Ford Explorer has a towing capacity rating of up to 5,000 pounds. There’s no comparison. The iconic 2019 Ford Explorer is the SUV you need for work and for play. With towing capacity of up to 5,000 pounds, you can trust the Ford Explorer to handle all your heavy-duty needs. And if you’re in the market for a seven-passenger SUV with this type of performance, you’ll find it in stock and ready for delivery at your Southern California Ford dealers.